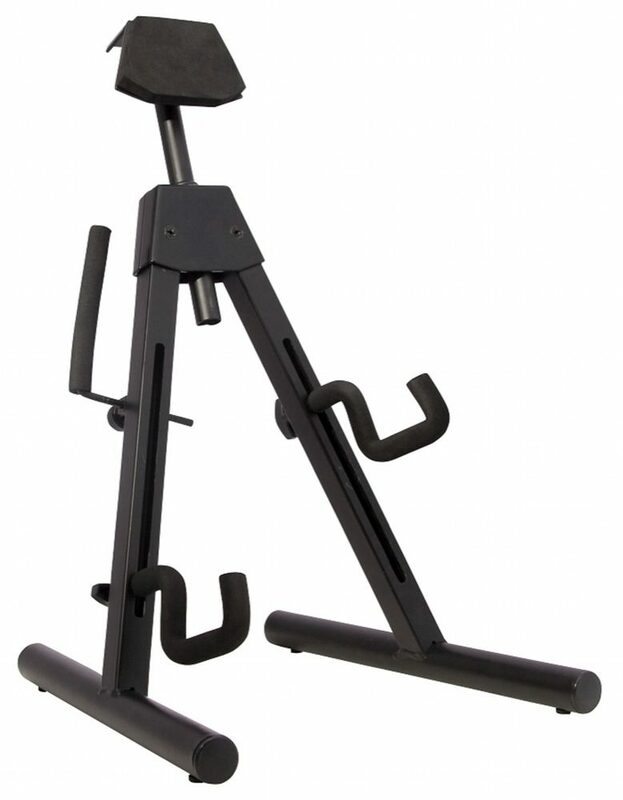 Fender's Universal A-Frame Stand for electric guitars and basses is the first of its kind, designed to hold not only offset instruments such as the Fender Jazz Bass and Jazzmaster guitar, but also instruments with more extreme shapes such as the Jackson Rhoads and Kelly models. Features include a height-adjustable padded body rest, dual adjustable yokes and an adjustable retainer arm for securing instruments in place. Overall: Great Stand, I needed a stand for my Gibson Fire bird (Reversed). None of my current stands work and keep my Guitar Safe by supporting all of the body. You can adjust the supports exactly the same configuration as the Gibson Body. Plus with the additional side support just adds to the security. I heard they work for Flying "V's" Also? Overall: The universal A Frame Guitar Stand I use it to hold up my RK-100 Korg Keytar. Strong, well buit and hold the Keytar safely and sterdy. For the price you can't go worng with this piece of equipment.